Just a quick one before going out. Spent most of the day painting (as in painting and decorating). All white paint in my hair (at least I THINK it’s white paint…lol!). The colour scheme? not mine I may add….white paint on white paint. I’ve got that snow blindness or whatever you call it. Antarctic. I’d love to go to the Antarctic! 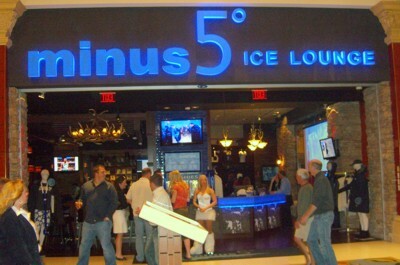 The nearest I got was the Minus 5 Bar in the Mandalay Hotel, Las Vegas. It’s a strange place to say the least. You pay your money and are issued with a parka and padded mittens and boots . When you go a bit further along you are given a bit of a talk about the bar…finally you are allowed into the inner sanctum. 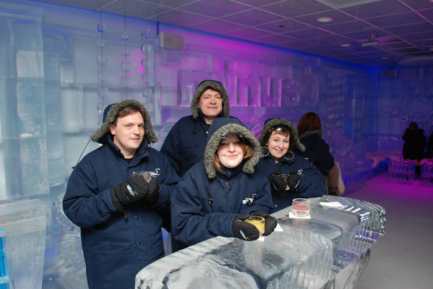 A bar made of ICE! Thats right, actually made from ice! 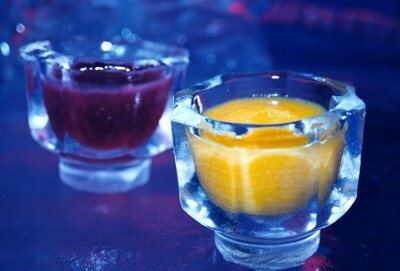 there are ice sculptures, ice seats (with rugs on)…even the glasses are made out of ice! How cool is that? Obviously VERY lol! This entry was posted on July 26, 2009 at 1:01 am and is filed under PAST PLACES, SCULPTURE, WHAT HAPPENED IN VEGAS STAYS HERE! with tags hotel mandalay, las vegas, minus 5 ice lounge. You can follow any responses to this entry through the RSS 2.0 feed. You can leave a response, or trackback from your own site. I love minus 5 ice site 🙂 thank you gay !